I’ve been on a bit of a decluttering binge over the summer holidays. Holidays always feel more productive to me when I have a few small projects to do. On the hit list was the bookcase, the filing cabinet, and the lounge room in general. The lounge room is actually pretty good, with the exception of the shelf where the DVDs are kept. DVDs are one of those things that take up a lot of space (particularly considering how small the actual disk is), and make a room look cluttered if they are on display. Ours have been sitting on a shelf in our lounge room since we moved here, and they were annoying me. I was perusing Pinterest for some ideas to get rid of the clutter when I saw the idea of popping them into DVD sleeves. This way, ten DVDs take up the same space as only two DVDs in their plastic cases. I was sold on the idea. I spent a bit of time researching the different types of sleeves, and ways of storing them, and then came up with a system where we put all the DVDs are in sleeves and then loosely sorted into two boxes. I got the sleeves from eBay and bought 200 sleeves for about $20 plus postage (Office supply shops also have them, but there are none near the farm). I still have one pack of 50 spares, which I have popped in the back of one of the boxes so that any future DVDs are catered for. to some similar sleeves (I can no longer find the same ones). You pay no extra, but I get a small commission for each purchase. 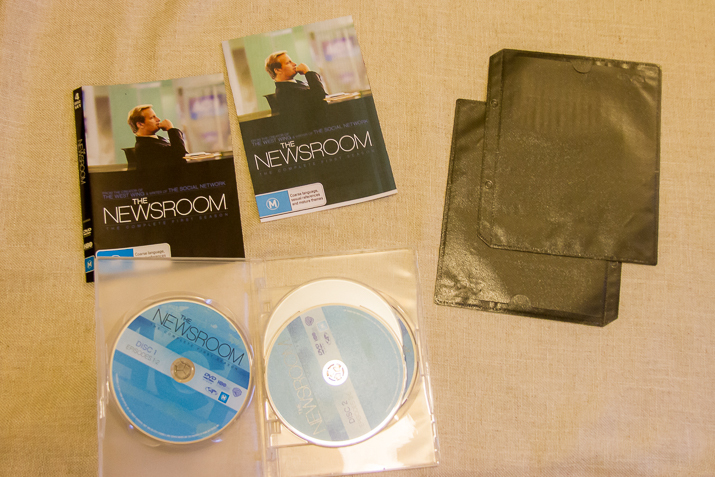 It is very easy to switch the DVDs from their cases to the sleeves. Open the case so that the paper label will slide out easily. Flatten the label so that the spine faces towards the front. Slide the label into the front of the sleeve. If there were any additional booklets etc with the DVD I popped them in the front too. Slide the DVD into the pocket on the rear of the sleeve. If there was a second DVD such as a special features DVD I put the second DVD into the sleeve with the original. 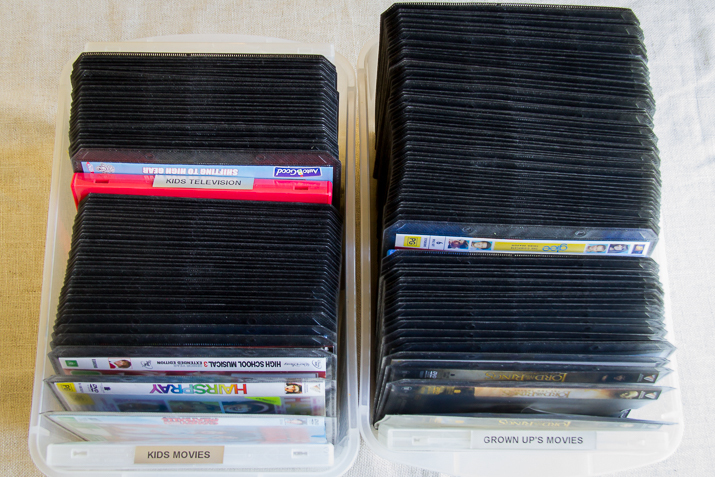 I had seen DVDs kept in sleeves in a folder, but I thought that the folder would be too awkward to store and flip through, so instead I sorted them into kids and grown up programs (adult programs sounded a bit dodgy), and put them into two plastic boxes. I then further sorted them into movies and television programs. I used some of the spare plastic covers to create dividers. I thought that these would make it a little easier to find the DVD we were looking for. I did consider alphabetising the movies but thought I was making a rod for my back. Particularly with the kids. What about series with lots of DVDs? We have several television series that take up quite a few DVDs. I used our printer to copy the front label page, cut it out, and slipped it into a second label. I put the first two disks with the original label, and then the rest in copied labels – two per sleeve. This does mean that some series will have several sleeves. Another alternative could be to tie the sleeves of each series together. I’m going to see how this works for us before I try any further improvements. It did take me several hours to transfer all the DVDs. The longest part was sorting out the television series with six or seven DVDs. How long it will take you really depends on how many DVDs you have. We used to have two and a half shelves stacked with DVDs in plastic cases. Every time one was taken out the rest fell over and it looked messy. 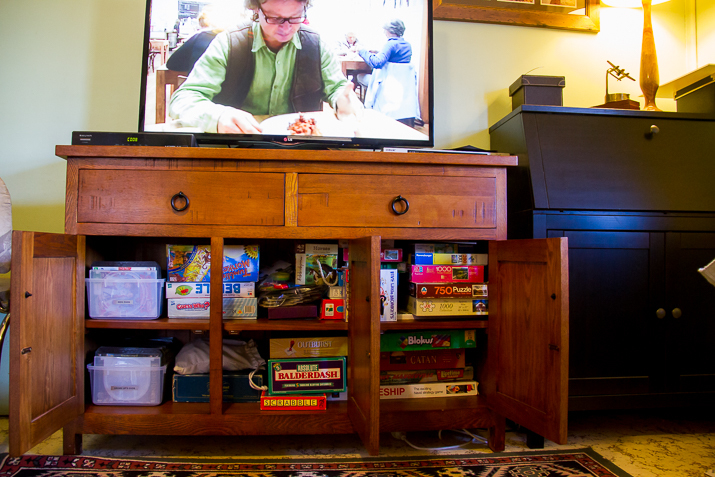 Now we have the two tubs in the buffet cabinet under our television. Much more compact and out of sight. just in case you were looking for them! 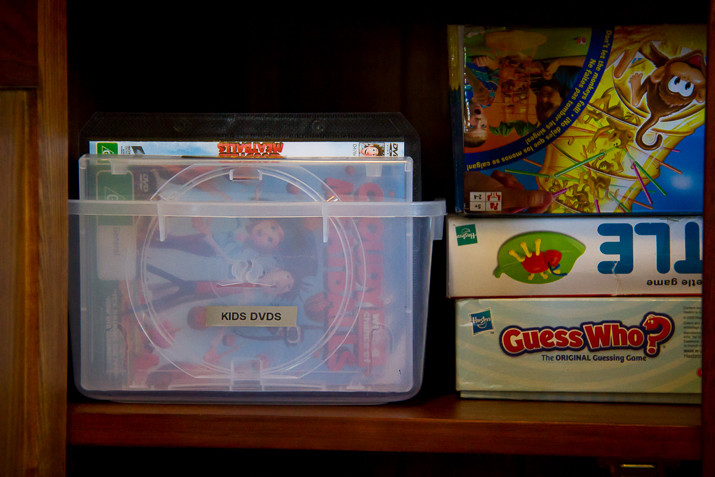 Have you got a clever way of storing DVD’s? 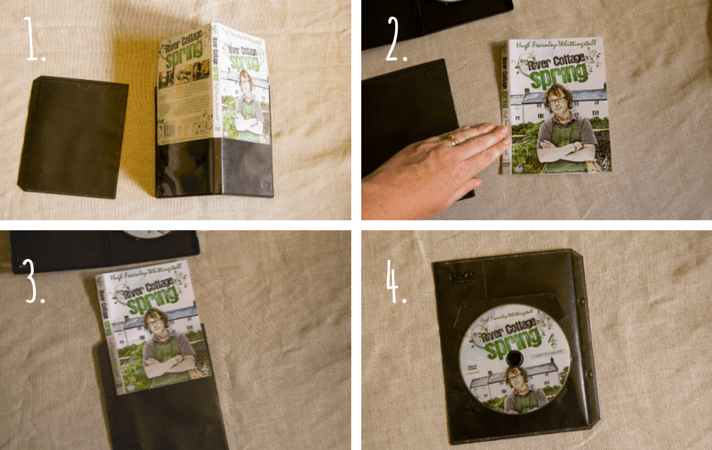 Have you tried using DVD sleeves? I know this is old, and you are unlikely to see this, but I’m DESPARATE to find these sleeves, and can’t find them on EBay. Any chance of you linking to them? Thanks! Great post! Have you kept your tv show collection in sleeves, or did you change your method? Still in sleeves with no problems. Hi Amanda, I'm not sure of the brand. I just searched for them on ebay. Good luck. I've looked into DVD sleeves that will hold the label but haven't found any I like. What kind/brand are these? This looks awesome! I did something very similar recently, just with cd sleeves instead – it turned our whole wall of dvds into four neat little boxes – so much better! Love the new look blog by the way! And this is such a great idea as I have an entire cupboard/shelf dedicated to DVDs, thanks for sharing! Off to ebay I trot! I have been meaning to get a drive to put our CDs onto as well. I am seriously impressed with your dedication. Ours are all shoved in a cupboard. Well done! Love this. My husband hates the idea of removing DVDs and CDs from cases thinking they will get wrecked but this looks great. Will show it to him. First up is the underused cd collection he won't part with (I listen to spotify anc he has a vinyl collection). He has agreed to buy a dedicated drive and load all the CDs on there woo hoo. 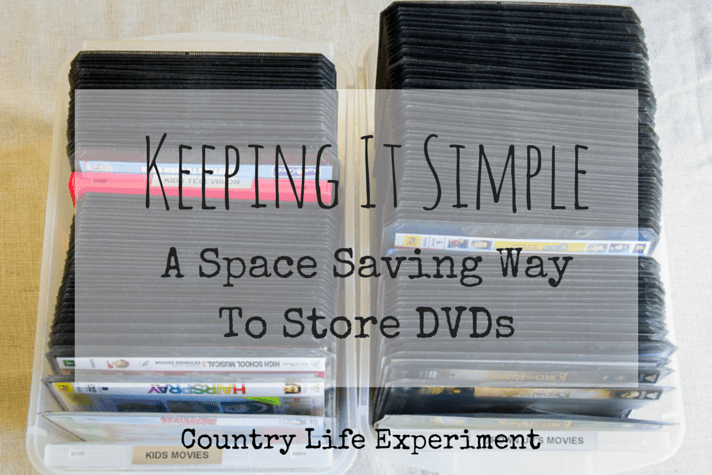 This is a great idea – we have so many DVDs and they take up so much space! So do you have any ideas what to do with my trillions of CDs too? Ha! Had a bit of a giggle. I was struggling with our DVD collection too. Despite regular culls, it is still on the large side. I googled dvd storage on pinterest and about 20 ideas came up. I picked the best bits of several ideas. I have seen several different types of sleeve systems. So far, so good with ours. I have put all the plastic boxes into a big garbage bag in the shed for a few months before we get rid of them, just to make sure we are still happy with the system. I like the idea of those cases – I looked at much the same thing – but I didn't have a place to keep them, and I thought that the kids would forget to put the dvds back in, where as having individual sleeves means that they will be kept together..
oh my that is priceless. kids say the funniest things. This is genius and the perfect kick I needed right now as our DVD collection just keeps growing!! I've been planning to do something like this forever and now I will! Thankyou! PS, I'm with you, grown up movies sounds much safer than adult movies. Although my son once asked if you could buy new parents at the "adult shop" we just drove past. I am still laughing about that 10 years later! wow what a great space saving idea. we have some of those zip close folder things but they r so worn out from flipping through all the time. all our others are currently stored in pretty baskets which sit besides our stereo, but it does annoy me….inspiration time as we move next month and i want to space save as much as i can. ours have 4 spaces per page. we have four; one for children's, one for adults, one for teens and one for series. Have stored the cases with the sleeves in the shipping container.